Here’s what happened in last night’s game. Each PC gets 1,320 xp. The Juma Gang decide to head south from the entrance, through the troglodyte lair to the door they’d left unopened the first time round. The lair seems to have been stripped of weapons and supplies and abandoned, with the troglodyte bodies left there to rot. 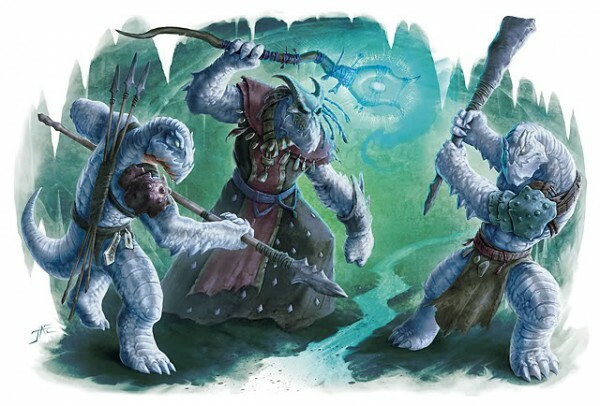 Juma Ji’ad opens the door and the PCs sneak down the corridor, surprising the Marrowmaw troglodytes in the large cavern ahead. Ulthar is less forthcoming with his tactical instructions than usual and the party spread out to attack different reptilian humanoids, rather than concentrating on one or two opponents at a time. Hrothgar ends up surrounded by the chieftain Ssark and two of his warriors and only avoids falling unconscious due to Sora’s knightly intercession where she puts herself in the line of fire (actually a nasty bite). After a few rounds, first Ulthar, and then Sora and Juma, have disposed of their opponents and are able to help Hrothgar out. The PCs surround Ssark and Gil finishes him off with a magic missile. A search of his chamber turns up some gold and gems, and a beautifully-made magical greatsword which Sora claims. The party return back the way they came to explore a side cavern up a flight of stone steps to the west. This turns out to be the troglodyte hatchery with leathery eggs buried in the soft sandy earth in here. Deciding troglodytes are inherently evil creatures, they destroy the eggs. 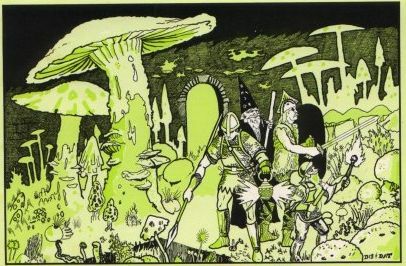 Crossing the stream via the log bridge, the PCs head east to a large cavern filled with giant puffball fungi; troglodyte bodies rot in here too, covered in mushrooms. Hrothgar points out the poisonous deathcaps growing amongst the edible puffballs. Ulthar bravely decides to go into the room first. Unfortunately, he passes too close to a deathcap which releases its deadly spores as he crosses the room. Sora flies across the chamber, avoiding the fungi, but the others all end up poisoned as they attempt to get to the other side. Hrothgar is convinced there must be some treasure in the cavern and spends a few rounds looking without success, exposing himself to dozens of spores in the process. Eventually he gives up and the PCs go north towards the prison cavern. Here, four warren trolls stand guard. The PCs are quickest to act and Hrothgar slays the first troll with a critical hit almost immediately. Two others engage the party in melee while a third throws boulders (ineptly) at Gil from atop an escarpment. The eladrin uses his fire magic to keep the trolls from regenerating, although at one point a troll he has set on fire scorches Sora badly. Juma goes after the rock-thrower, while Ulthar grabs the Scourge of Vardar from Gil and uses it to finish off the stop the two unconscious trolls from getting up again. The battle over, the PCs head towards the great doors leading to Skalmad’s throne room.